Rio de Janeiro is a city that offers boundless opportunities for new culinary experiences, and a good way to sample the true taste of Brazil is to grab food on the hoof from an inexpensive juice bar or street stand. Two absolute must-tries for the culinarily curious are pao de queijo and acai. The former is a delicious little bread roll made from cheese and manioc flour (meaning it is naturally gluten free), and the version served at Santa Teresa's organic haven Cultivar Brazil is truly a thing of joy when served piping hot from the oven. The latter is a Brazilian power berry sourced from the Amazon, which is classed as a 'super fruit' and has made its way into super-expensive juices and smoothies in the USA and Europe. Here, it is served crushed and frozen as a kind of sorbet, whose intriguing taste somehow calls to mind nuts, ice cream and bubble gum. 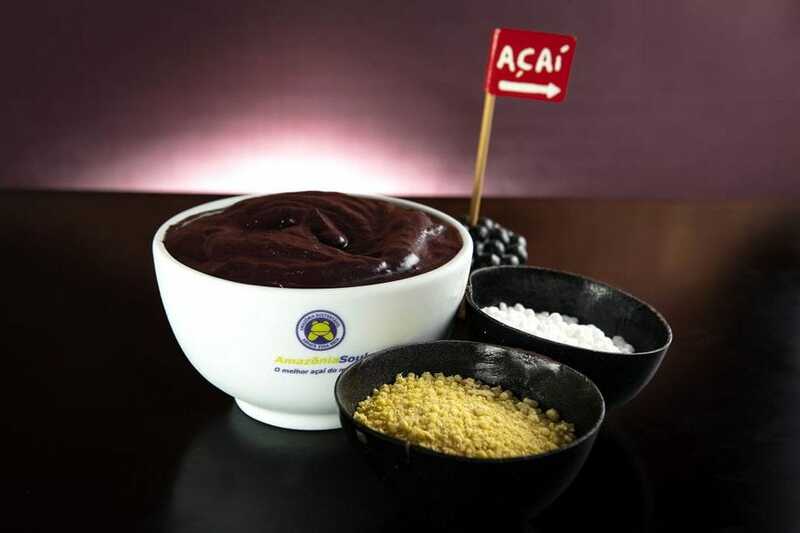 Acai is considered a potent energy booster but is often served so stiff with added sugar that any extra energy may simply be a sufr rush - try the version at Amazonia Soul, where the berry is served at its pure, antioxidant-packed best. The deliciousl toasted sandwiches at Cafecito and Cafeina can be ordered 'pra viagem' (to go), while Rio's buffet restaurants also offer take away options. Take just a slight detour from Santa Teresa's main tourist trail and you'll find one of the neighborhood's best value bar-restaurants. Located just a few minutes' walk (follow the tram line uphill from the main square at Largo do Guimaraes), this laid-back little bar offers an excellent range of bar snacks and main meals at prices that compare very favorably with those down the hill at Largo do Guimaraes. There's also a decent cocktail list and a seriously well-mixed caipirinha. Saturday nights see live samba, jazz and bossa nova bands draw a sizable crowd of locals - get there before 8pm to grab one of the few sidewalk tables here. Budget travelers can feast on all manner of treats at this downtown lunch restaurant. 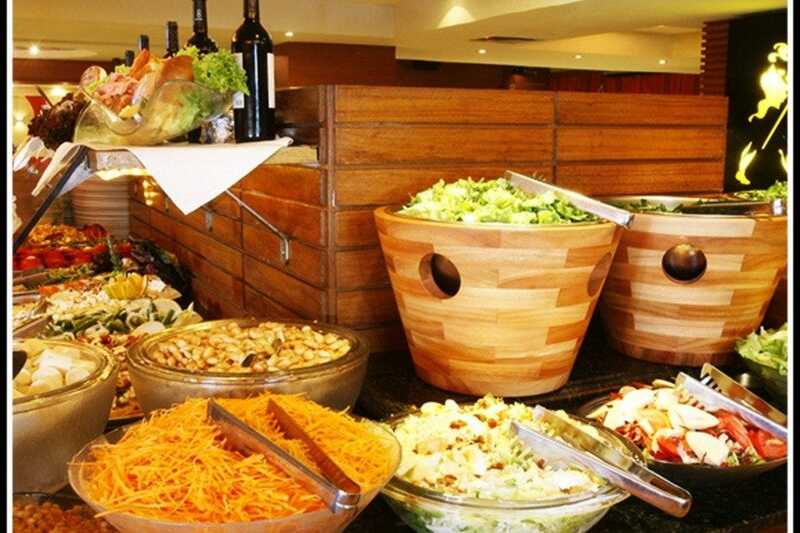 The self-service buffet includes everything from sushi and rice noodles to hot meat, fish and chicken dishes, alongside staples like rice and beans, fries, and local specialities such as pao de queijo and aipim. Priced at less than R$2.60 per 100 grams, the Centro branch of this city-wide chain is cheaper than those in Ipanema and Copacabana, and floods with office workers between noon and 2pm - head here before or after these peak hours for discounted prices, shorter queues and more elbow room at the buffet. High on a hillside in the boho, historic neighborhood of Santa Teresa, each weekend sees Nega Teresa set up her chandelier-lit stall selling authentic Bahian acaraje (pronouced ah-kah-rah-gay). To the uninitiated, these savoury treats are bean patties that are fried in palm oil and then split open and filled with shrimp, hot pepper sauce, chopped tomatoes and a gooey but delicious okra paste. Veggies can omit the shrimp, and customers can ask for as much, or as little, hot sauce as they can handle. Nega Teresa's stall is located right next to popular local hangout Bar do Bonde, whose caipirinhas make an excellent companion to this delicious street snack. 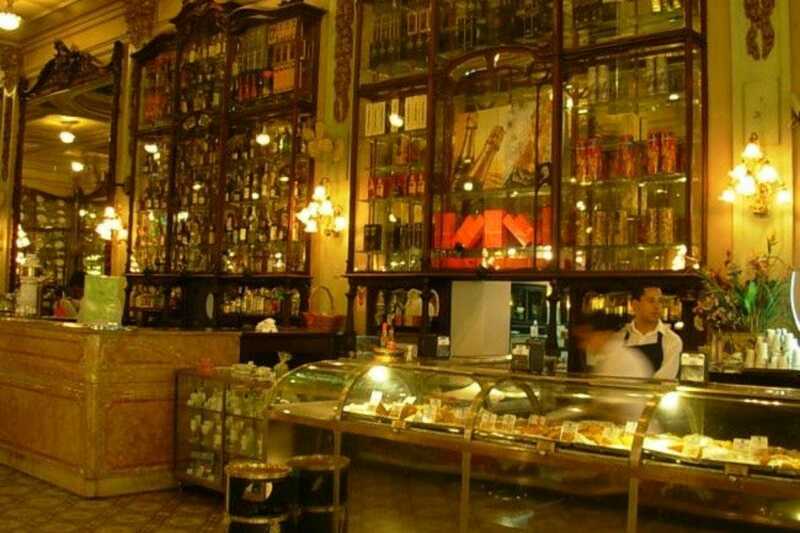 For a taste of Rio's Belle Epoque past, head to this historic cafe-restaurant in downtown Rio. Ornate chandeliers and jacaranda wood mirrors make an elegant setting for breakfasts, brunches and afternoon teas, and this is the ideal place to take the weight of your feet and soak up the opulence during a Centro shopping or sightseeing spree. Diners with time to spare can linger over vast spreads of cakes, breads, jellies, jams and hot drinks, while those in a rush can opt for a takeout treat from the front-of-house standup counter. 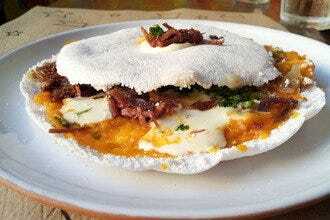 Made from nothing but specially-sieved manioc flour, tapioca is one of the real joys of Rio de Janeiro's street food scene. The flour (which is naturally gluten-free) is tipped into a hot pan where it forms a kind of pancake to be loaded with the filling of your choice. 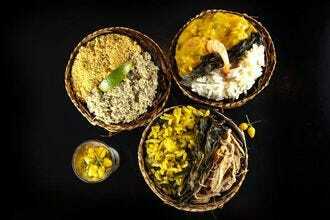 Popular sweet options include banana and Nutella, while savory fillings include chicken, cheese, or even sun-dried beef. 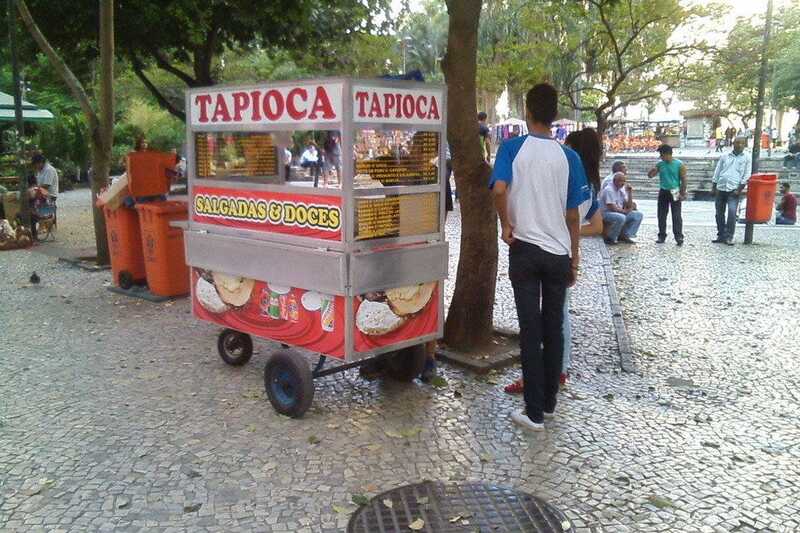 Increasingly popular due to a demand for gluten-free goodies, tapioca stands can be found across Rio de Janeiro, from the beaches of the Zona Sul to the sticky streets of Centro. Beware, you may quickly become addicted. The down-town branch of Pampa Grill (the original branch, in Barra, has been in business some 30 years) is a popular choice among local business people, who head here for the excellent cuts of meat on offer, along with the vast range of hot and cold side dishes that tempt diners to the heaving buffet bar. Pampa Grill operates two dining systems - you can choose to pay by weight (around R$6 per 100 grams) or you can pay a set price of R$90 for all you can eat feasts. The first option is great for those looking for a light lunch, while those with hearty appetites would be wise to opt for the latter. Whichever you opt for, you are guaranteed a memorable culinary experience, with the opportunity to feast on top quality cuts of meat, fresh fish and seafood, and fresh tropical fruits and vegetables in more variations than one could ever imagine. Acai (pronounced Ah-sigh-ee) is a 'power berry´ native to the Brazilian Amazon that has been credited with everything from boosting energy levels to preserving youthful looks. While there are any number of spots purporting to sell acai (usually served as a frozen pulp, sorbet-style), it generally comes served so thick with sugar that any extra energy you feel will almost certainly be a sugar rush. Here, the bowls are full of the real deal - the purple berry is crushed in all its anti-oxidant goodness, and you can add fruit and granola for extra vitamins should you want an extra energy boost. 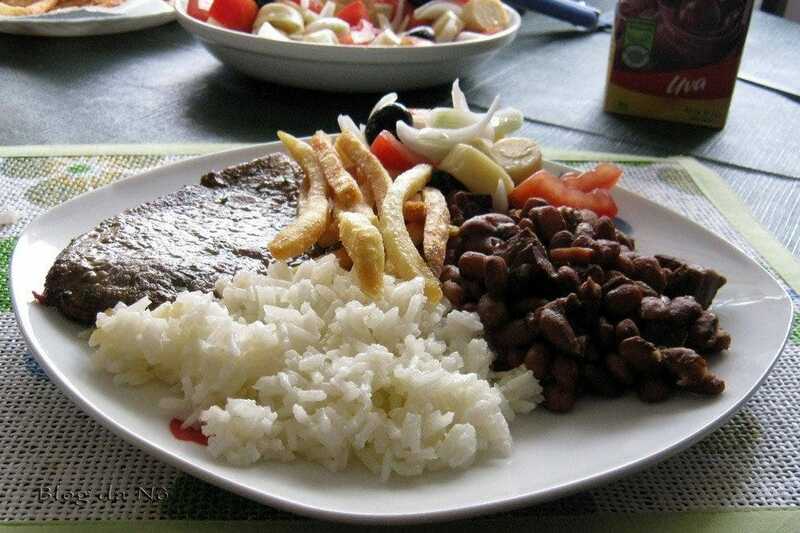 The restaurant doesn't just serve the sweet stuff though - this is the place to come for traditional Amazonian dishes, many of which feature shrimp, manioc, hot peppers and other native ingredients. 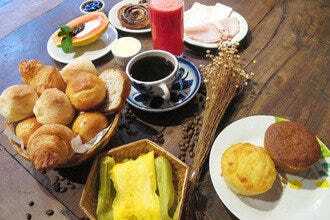 Located a few blocks from Ipanema beach and right next door to the strip of backpacker lodgings dubbed 'Hostel Alley', this health food store, buffet restaurant and snack bar offers a huge range of wholesome ingredients for self caterers as well as a range of eat-in dishes that are every bit as tasty as they are nutritious. While there is plenty of choice here for vegetarians, New Natural is not entirely meat-free, with low-fat chicken and fish putting in a few appearances on the menu. The buffet operates on a pay-by-weight system, and prices here, while on the high side, are reasonable for the neighborhood. There's an air conditioned lounge upstairs and a couple of sidewalk tables and chairs, making New Natural a favourite spot among backpackers looking for a quick, healthy lunch. 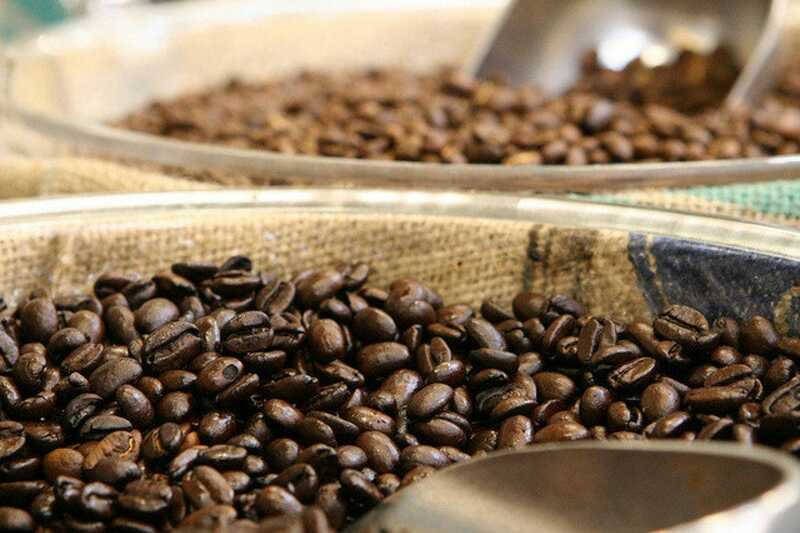 Given its abundant supply of coffee beans, Brazil has been surprisingly slow to pick up on the coffee bar trend, but Cafeina is one spot where caffeine boosts are more inventive than simply with-or-without-milk. Alongside a range of cappuccinos, lattes and espressos, there are some seriously tasty cakes, pastries and other goodies that make wonderfully indulgent companions to a creamy coffee. 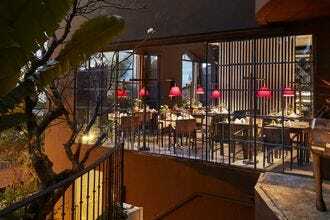 Sandwiches here are good lunch options, and the place also serves lavish breakfasts and afternoon teas. Cafeina is a good place to linger over a coffee, while those who are pressed for time can order their food and drinks to go. 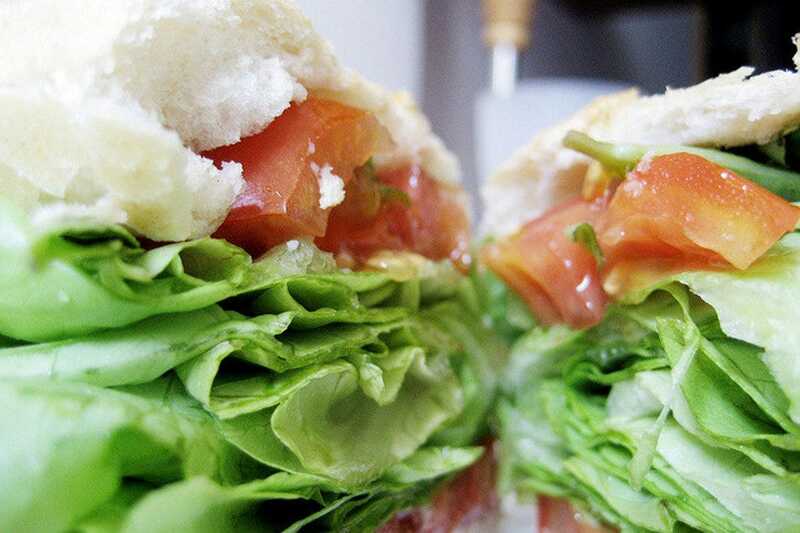 This little gem of a lunch spot at the heart of Santa Teresa is a real treasure trove of tastiness for anybody with an aversion to gluten or a preference for natural, organic ingredients. Alongside a range of wholemeal sweet and savory tarts and pies and some yummy sandwiches, there are gluten-free cakes, tarts (try the palm-heart and yogurt) and a mini-store stocked with a range of pastas, biscuits and other goodies to take away. 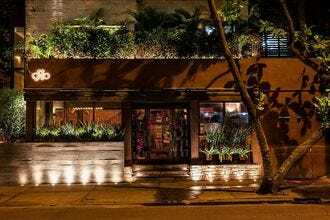 In addition, Cultivar Brazil serves unarguably the best Pao de Queijo (little cheese breads made with manioc flour), here made with organic ingredients and famous across the city.